Everyone is hungry after a fun day at the beach and they just can’t resist the smell of fresh fish being cooked on the grill. The Sylvanian Families seaside restaurant has a nautical theme which your Sylvanians will love! Over 60 pieces of accessories; Includes a viewing deck, jetty and blue sea panel. Encourages imagination; One supplied; Size H19.2, W29, D36.7cm; For ages 4 years and over; EAN: 5038701041904. WARNING(S): Not suitable for children under 3 years old. Sylvanian Families are an adorable range of distinctive animal characters with charming and beautiful homes, furniture and accessories. They live, work and play in the idyllic and wonderful land of Sylvania. The Sylvanian Families Seaside Restaurant has an exceptional reputation for serving the finest barbecued seafood in Sylvania. The jetty is the perfect place to feel the sea breeze after dinner. A fully fitted indoor barbecue and over 60 pieces of content make this a beautifully detailed set.Everyone is hungry after a fun day at the beach and they just can’t resist the smell of fresh fish being cooked on the grill. 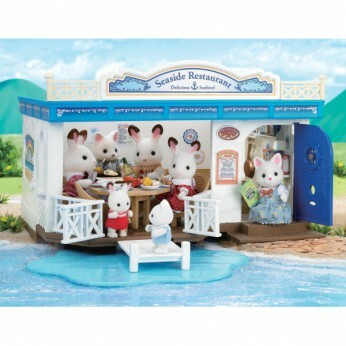 The Seaside Restaurant has a nautical theme which your Sylvanians will love!Includes over 65 pieces. Figures not included. This toy costs approximately £39.99 (for the latest and best prices make sure you check our retailer list for the Sylvanian Families Seaside Restaurant above). In our review of Sylvanian Families Seaside Restaurant we classed it as being suitable for ages 6 years, 7 years, 8 years but recommend you check the manufacturer specific advice before purchasing.